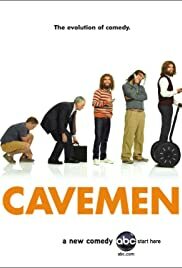 A trio of Neanderthals struggle to live in modern day America. Too much wry humor for you? When I first saw the Geico commercials, I was floored by the quality of their writing and acting. When I heard they were being made into a sitcom I was very happy and filled with anticipation, unlike most everyone else. The public seemed bound and determined to hate this series before even seeing the first episode. Their reviews seem to be based on their preconceptions and not on what they actually saw. What I saw left me ambivalent at first, but ultimately satisfied. The great news is, it's just like the commercial. In this case, that's a very good thing. The hipness and sardonic humor are all still there. I'll go out on a limb and say that this is better writing than the normal sitcom audience can appreciate. The actors pulled off their lines as beautifully as the commercial's actors. The show comes with problems that will initially hamper it. The first episode we saw was obviously not the pilot, so we got no introductory development. It's going to be hard to tell these guys apart, but we'll get used to them over time. The stress these characters radiate in their struggle to cope with homo sapiens culture make them hard to warm up to. Especially Nick, who has a real chip on his shoulder (though this allows him to have the shows most bitingly cynical lines). And dare I say that the dry humor is too subtle and sophisticated to allow the series to succeed? Will enough people appreciate it? I doubt it. Then there's the question of whether this series is really a parable about racial tensions and stereotyping. Its creators went to lengths to deny it, but its scenario makes it almost inevitable. Frankly, I think I saw some of it in the first episode. I sensed that the writers were ambivalent about whether to go in this direction and take on the issue. Their uncertainty came through in the script. We'll have to wait and see what they decided to do. This series looks like it will fulfill my hopes, though everyone else seems to wish it would just go away. I'm already anticipating buying it on DVD when it's cancelled. If you people don't want it, then I'll gladly take it. Future generations will know that I knew a good thing when I saw it. 40 of 68 people found this review helpful. Was this review helpful to you?